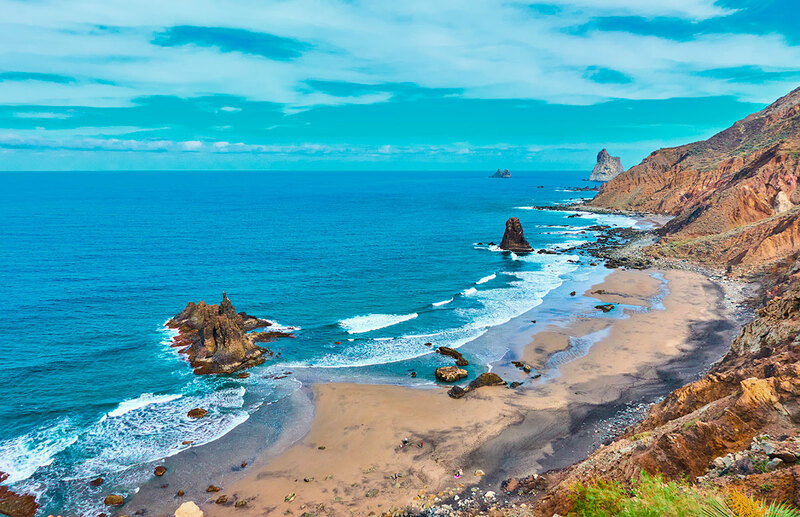 Tenerife’s coastline is characterized by being mostly abrupt and with beautiful but not very accessible, dark volcanic landscapes, especially in the north of the Island. 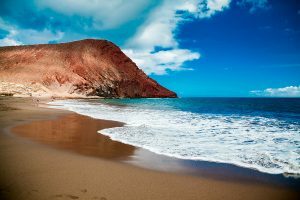 Nevertheless, there are some very nice natural sandy beaches in Tenerife, some of them can be crowded in summer and others are usually hidden and harder to find. 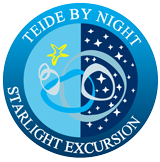 At Teide By Night we know how different your Tenerife holiday can be depending on where and when you go during your stay. 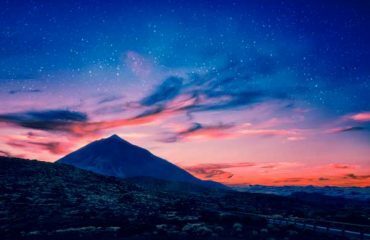 The Teide National Park can be very crowded during the day but during our tour by night, you are experiencing a unique and more intimate visit. 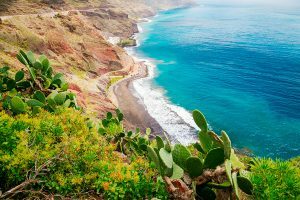 We’ve made a list of those natural beaches in Tenerife you can escape to by going off the typical tourist trail and avoiding lines and lines of hammocks. This small sandy beach is located at the end of Los Gigantes Resorts and directly by the high cliffs. The views are incredible and if the sea is calm the water is very clear and ideal for snorkelling. Nearby, from the Los Gigantes Marina, lots of boat excursions take you to see dolphins and whales. This white sandy beach is only accessible by a 20 min. foot walk and lies under steep slopes south of the village La Caleta in the Diego Hernández Cove. We recommend you visiting this beach when the tide is down since the sand can be almost completely flooded at higher tides. Apart from being a naturist beach, the curious thing is that some people camp on this beach all year along living in tents or caves. The water is usually crystal clear and very calm, perfect for snorkelling! The beach of Leocadio Machado by the town of El Médano is very popular amongst Windsurfers thanks to its waves and usually stronger winds. On the other side of the red mountain “Montaña Roja”, you can find La Tejita Beach. Beautiful natural dunes surround the longest natural beach on Tenerife, making it a popular spot for nudists thanks to its privacy. The smaller beach right next to the mountain is perfect for having your privacy. 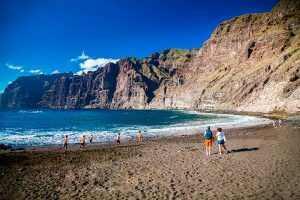 Fifteen minutes away from Puerto de la Cruz, this small and protected beach has beautiful black sand and is frequented by locals mostly. It’s surrounded by banana plantations and has a small beach bar that serves tasty local food and drinks. Usually, the waves are very strong in this area but if the tide is low we are lucky to enjoy a beautiful postcard-like beach. We can find a small and inexpensive parking lot from the bar owners nearby. 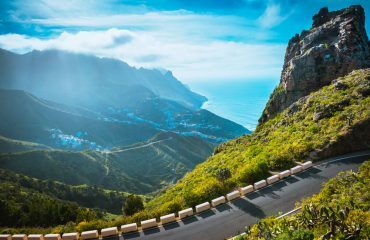 At the very end of the curvy road of the Anaga Rural Park, lies the little town of Taganana with some of the most beautiful volcanic sandy beaches in Tenerife and small restaurants with local food. The beaches of Almáciga and Benijo follow the town’s beach Roque de las Bodegas and are surrounded by a surreal volcanic landscape. You really feel like you are on the end of the Earth, which in some way is true. 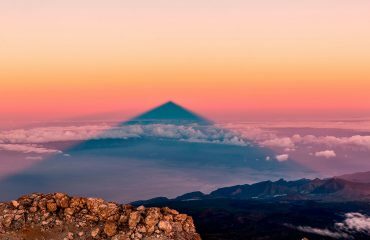 There’s nothing but ocean in between this spot of Tenerife and Iceland! This beach lies northerly of Santa Cruz de Tenerife and is not accessible by car. When the tide is low, this beach is a beautiful sandy beach surrounded by a natural landscape in the middle of the Anaga Rural Park. You will need to go by a not very easy hiking trail starting from Igueste de San Andrés or by water taxi from Santa Cruz or San Andrés. This beach is ideal for a morning bath since it looks East and is backed by a high cliff. You can find this small beach with black sand after Las Teresitas Beach if you continue the road. A little beach bar serves drinks. If you’re looking for a cosy and not crowded beach nearby Santa Cruz, this one is for you!